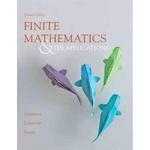 Finite Mathematics & Its Applications 11 Edition Finite Mathematics, Eleventh Edition is a comprehensive, yet flexible, text for students majoring in business, economics, life science, or social sciences. The authors delve into greater mathematical depth than other texts, while motivating students through relevant, up-to-date applications drawn from students’ major fields of study. Every chapter includes a large quantity of exceptional exercises—a hallmark of this text—that address skills, applications, concepts, and technology. The Eleventh Edition includes updated applications, exercises, and technology coverage. In addition, modern and relevant topics such as health statistics have been added. The authors have also added more study tools, including a prerequisite skills diagnostic test and a greatly improved end-of-chapter summary, and made content improvements based on user reviews.